Aero-Seal Duct Sealing is a technology that literally seals your heating and air-conditioning ducts from the inside! In the average home, leaky ducts allow for as much as 30% of the air from your furnace or air-conditioner to escape before it even gets into the room. In other words, it’s pretty much wasted. Now if your ducts are easily accessed you can attempt to seal the leaks yourself but in most cases you just can’t get to your ducts because their behind drywall on walls and ceilings or when they are reachable, it’s just plain difficult to access the portions of the duct that are up against another surface. On top of that, how do you know that you found and fixed all of the leaks? With Aero-Seal Duct Sealing the first thing that happens is that the contractor blocks all of your registers with foam blocks. You see, when the duct work becomes pressurized, the only place for that pressure to escape is through the leaks in the duct. A synthetic material, the same material that is used as a bubble gum base and to make baby pacifiers is heated sprayed into your ducts where it is pushed to the leaks, cools and hardens. After about 1.5 hours, your ducts are dramatically tighter than when the process began and the contractor will verify this for you with a before and after test. They will also measure combustion gases from your furnace to make sure no harmful gasses are reaching you or your family. The cost is approximately $1500 and many states have rebate programs in the range of $300 so you’ll pay back the investment in about 3 years with the fuel savings since you’ll be getting dramatically more of the hot or cold air into your living space where it belongs. The best is that your home is going to be more comfortable. 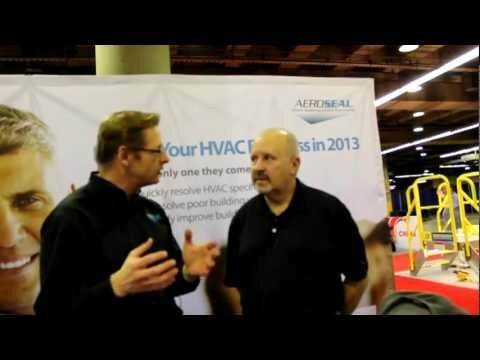 I had the pleasure of speaking with Neal Walsh from Aero-Seal at the AHR Expo in Dallas and in the video below Neal does a great job of explaining the benefits as well as how the technology works showing you the actual equipment that they use. It’s well worth watching and duct sealing with Aero-Seal is well worth the investment as it’s good for both the environment and your wallet.